This classic condiment to the Thanksgiving meal needs no introduction. I will confess that more often than not, I prefer to pair the sweet tang of this sauce with my slices of turkey instead of drowning them in gravy… Is this gravy blasphemy? Perhaps. But in the end, I always go for a third helping anyways, so all sauces and gravies on the table will eventually get my undivided attention! Just remember to make this ahead of time so that it can cool down before you serve it. 1. In a saucepan, dissolve the sugar into the orange juice. Stir in the cranberries. Bring the cranberries to a boil, then reduce the heat and simmer for 10 minutes more, stirring occasionally, until all the berries have burst. Remove from heat. 2. 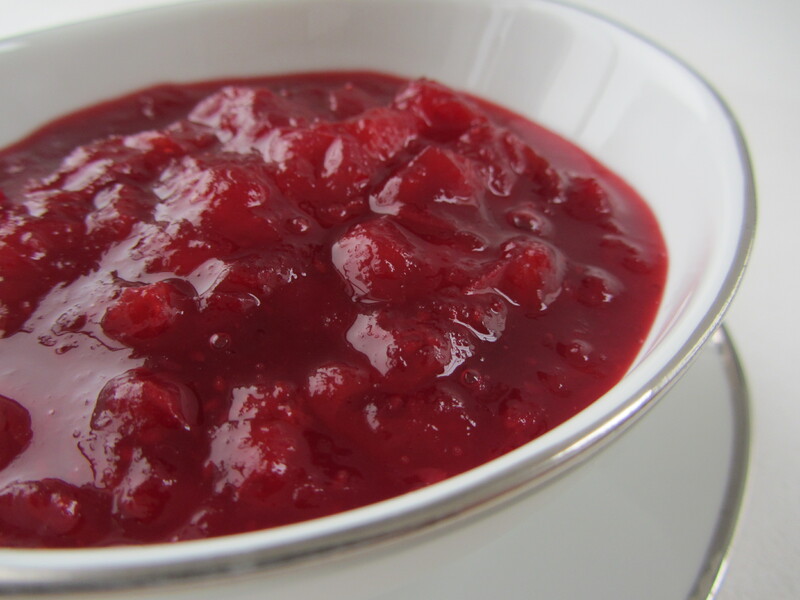 Place cranberry sauce into serving bowl, cover loosely with plastic wrap. Cool to room temperature before serving. Makes about 2 cups. 3. Wasn’t that easy? Now get to work on the turkey!